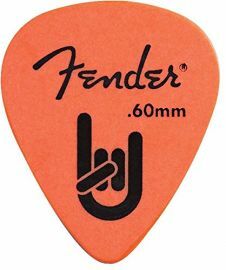 12 Picks in a set Standard 351 shape (approx. 31 x 26 mm) Gauge: Thin/Medium 0.60mm Colour: Orange. The "Rock On!" Touring picks feature the Fender® Rock-on graphic! These 351-shaped picks are precision cut and expertly tumbled to provide a smooth, rounded edge resistant to chipping. The finishing process assures a virtually slip-proof grip and unmatched durability even after hours of playing.